Many chess books teach the Lucena and Philidor endgames - but most rook endgames start in much more complicated positions. The objective of this series is to show you what to do in the earlier stages, when things are more complex and you may not even be sure who is winning. One of the key ingredients is obtaining active play for your Rooks, King and Pawns if you can safely do so. Here are real life lessons over the board with examples from Dana’s own games.Content: 126 minutes of instruction and analysis in a series of 4 lectures. 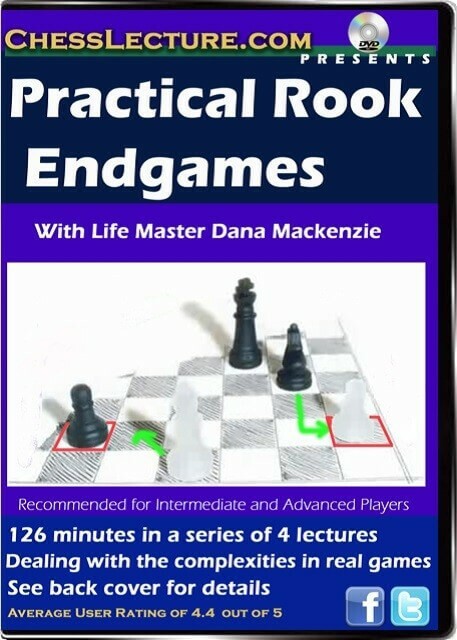 Fans on Chesslecture.com said: Thanks for showing a practical rook ending! The theoretical endings are all in the books. Of course I am looking forward to more of these. LM Dr. Dana Mackenzie is a USCF Life Master, a PhD mathematician, and an award-winning mathematics, science journalist and author. LM Dana Mackenzie started playing tournament chess during the "Fischer boom" of 1971-72 and never quit. Champion of North Carolina in 1985 & 1987, he became a master in 1988. Mackenzie now lives in Santa Cruz, CA and runs a chess club for kids at the local library. His passion for chess and his enthusiasm for teaching is unmistakable.